One of the world’s most famous advertising hoardings is up for sale for the first time in 24 years. The prime slot on the Piccadilly Lights, the electronic display at Piccadilly Circus, is on the market after Japanese firm TDK’s contract ended. Insiders suggested Land Securities, the owner of the celebrated London landmark opposite the Eros statue, could get in the region of £4 million a year for the spot, which measures 21.1 metres by 4.8 metres. However, the landlord may only be looking for a short-term tenant amid talk of a dramatic revamp of the whole display. It currently has half a dozen advertising slots. Two advertising industry sources claim Land Securities is mulling a long-term plan to turn the Piccadilly Lights into a single, giant screen that could be aimed at just one or two advertisers willing to pay a premium. LandSecs declined to comment on that suggestion but said it is “continually investing” in the site, with newer, better screens. 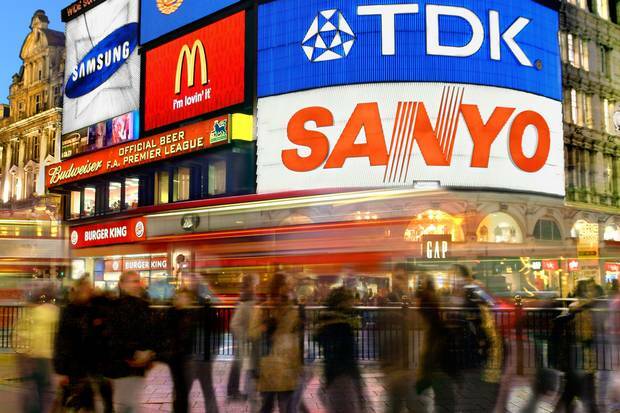 Piccadilly Lights is one of the world’s most expensive outdoor advertising spots — although it is still cheaper than New York’s Times Square — and advertisers change only rarely. This is only the second Piccadilly “light” to go up for sale in 20 years. South Korean car firm Hyundai became the most recent new advertiser in 2011 when it replaced Sanyo after 27 years. Coca-Cola has had one of the “lights” since 1955. Outdoor advertising consultancy Wildstone is advising Land Securities. An estimated 2 million people a week pass the site. We expect a number of world famous brands will jump at the opportunity to claim the site as their own, possibly for decades to come. It is thought airline brands could be among those keen to have their name in lights on the TDK site. Famous brands that have used the Lights include Schweppes (1920–61), BP (1961–67), Cinzano (1967–78), Fujifilm (1978–86), Kodak (1986–90), Canon (1978–84) and Panasonic (1984–94). The first brand to advertise was mineral water company Perrier.